High waisted jeans have come back in a big way. The fashion world has been taken by storm with the vintage feel and figure flattering fit offered by this style of jeans. Fashion bloggers are showing off the most sought-after high waisted denim on Tumblr in a range of finishes from acid wash to deeply saturated colored denim. 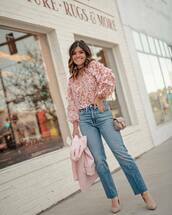 Cute high waisted jeans are often styled along with loose jackets and crop tops for a hipster look and these jeans look effortlessly chic when paired with high heels or strappy sandals. In addition to their style, they are super comfortable and look great on different body types.